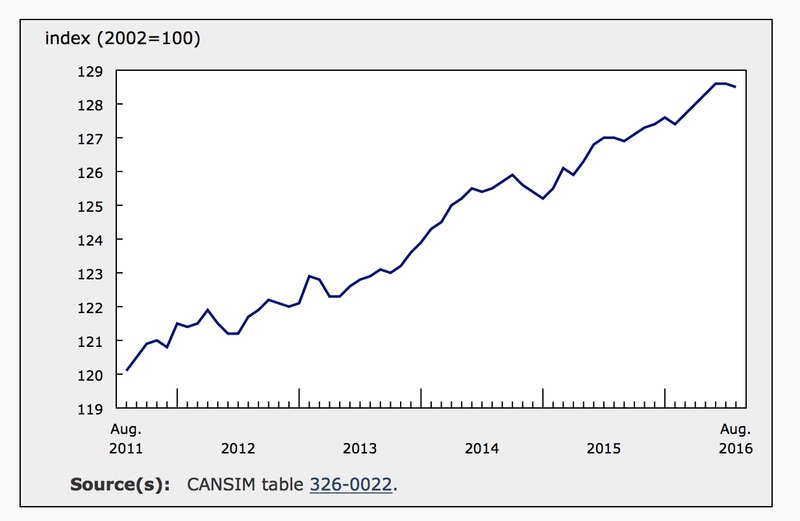 According to today’s report from Statistics Canada, the consumer price index (CPI) added 1.1% over the year ending in August, down from 1.3% for the year ending in July. Today’s CPI report will disappoint markets as expectations were for significantly higher numbers, including an uptick in headline inflation to 1.4%. Core inflation was also well below expectations, which were for a slowdown to 2.0% in August from 2.1% in July. However, core inflation was only 1.8% year-over-year in August. This marks the third consecutive month with no change in the core price index. The all-items index declined 0.2% in August versus expectations of a 0.1% increase and following a identical decline in July. Food and transportation prices dropped significantly; the respective indexes declined 0.6% and 0.5% on a monthly basis. The index for recreation, education and reading also fell 0.4% in August. Prices were higher for health and personal care as the index was up 0.6% for the month. Clothing and footwear prices grew 1.1% in August yet remain the only component of the all-items index to decline year-over-year. The shelter index inched up 0.1% for the month. Core inflation was flat versus expectations of 0.2% growth in August. Core inflation stripes out volatile items that have prices impacted by extraneous factors (fruit, fruit preparations and nuts; vegetables and vegetable preparations; mortgage interest cost; natural gas; fuel oil and other fuels; gasoline; inter-city transportation; tobacco products and smokers’ supplies). Slowing core inflation signals underlying weakness in the economy and should be a red flag to the Bank of Canada. With seasonal adjustments the all-items index fell 0.1% compared to expectations of 0.2% growth in August. Seasonally adjusted prices were unchanged in July. Seasonally adjusted core prices were flat in August, missing expectations of 0.2% core growth. The graph below shows the seasonally adjusted CPI over the past five years. Prices were higher in seven of the eight major components of the CPI for the year ending in August. The most significant growth in prices was for alcoholic beverages and tobacco products, which only represents about 2.9% of consumer spending. Food prices were up 1.1%. Prices at the grocery store crept up 0.4% for the year, while eating out reportedly became 2.5% more expensive. The health and personal care index climbed 1.8% and the index for household operations, furnishings and equipment added an annual 1.5%. The only major component of consumer spending to post lower prices over the 12-months ending in August was the index for clothing and footwear, which was down 0.4% despite the spike in August. The transportation index was up a marginal 0.3% despite the downward pressure of a 11.5% decline in gas prices. The index for public transportation jumped 4.0% year-over-year. Prices were higher across the country on an annual basis in August but less so than in July. The only province where there was an acceleration in annual inflation was Nova Scotia. The rate of inflation was unchanged in Ontario and Alberta and decelerated in the remaining provinces. Inflation remained significantly higher than average in Newfoundland and Labrador at 3.0% and New Brunswick at 2.2% year-over-year. British Columbia also posted higher than average inflation. 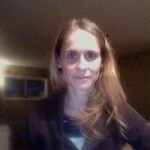 The price of gas was up 6.1% in Newfoundland and excluding food and energy prices were still up 3.5% in that province. The cost of shelter grew relatively faster in New Brunswick over the year compared to most provinces, up 2.3% compared to 1.3% for Canada. Again inflation was slow in Quebec. 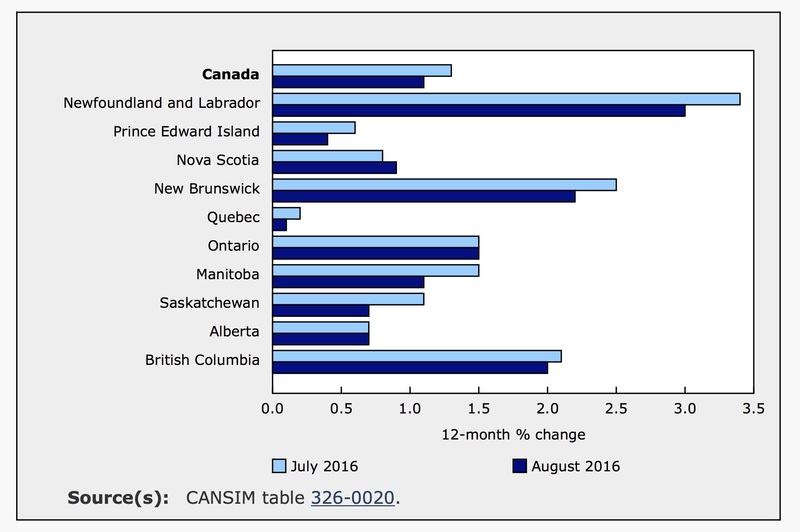 The index for that province only added o.1% for the year. Excluding food and energy, prices in Quebec were up 0.7% compared to 1.9% for Canada as a whole. At the same time, gas prices fell more in Quebec than in other provinces over the year, down 12.4% compared to a decline of 11.5% nationwide. Today’s report comes on the back of Governor Poloz’s speech, “Living with Lower for Longer” which explains that slowing global growth, due largely to demographic factors such as aging populations, is largely beyond the Bank’s control. However, in today’s low growth environment it is necessary to keep interest rates close to zero. The potential growth of the economy has slowed and a return to pre-crisis growth and interest rates is unrealistic. The disappointing inflation numbers will weigh on the Canadian dollar and increase the likelihood that Canada will cut its benchmark rate sooner rather than later. After cutting rates twice last year, further easing of monetary policy will likely be necessary to keep the economy from contracting. Expectations that rates will be lowered by the middle of next year spiked to 40% from 20% on today’sreport.